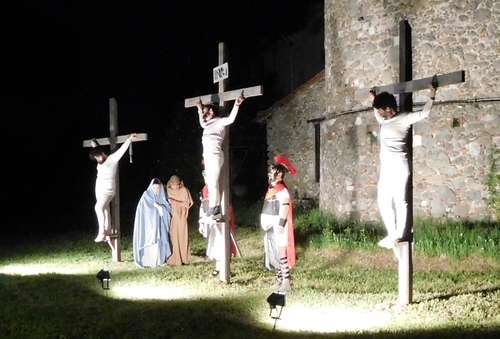 Borgo a Mozzano last night was the scenario for the enactment of Jesus Christ’s last human moments on Earth. Through the narrow alleys of this atmospheric town the various biblical episodes were played out in what was termed ‘Sequela di Pasqua’. The harrowing scene in the garden of Gethsemane followed where Jesus pleads to God that his bitter cup may be taken away from him. If not, however, ‘let your will be done’. Judas points out the Roman soldiers who they must capture by kissing Jesus who is then captured and led away. The trial follows and Caiaphas and his Pharisees demand Christ’s crucifixion. But Pontius Pilate can’t find anything wrong with Jesus. He washes his hands of the whole matter. Finally, there is the crucifixion behind the apse of Borgo’s main church of San Jacopo. This vivid enactment didn’t finish here for we were invited into the church of San Rocco magnificently decorated with an amplified altar and where there was a fine choral concert which also included Mozart’s ave verum. As traditional, the proceedings were wound out with a rinfresco in the parish hall. UFor lovers of literature and poetry there are two unmissable events today in our part of the world. The first is at 5 pm at Shelley House, Bagni di Lucca. It’s the presentation of Enrico Botta’s book, Mal-aria D’Africa, which has been produced by Luca and Rebecca’s publishing house Cinque Marzo. Who is Enrico Botta? He’s a Viareggio director and known to the public for his musical ‘Snow White’ and ‘Aenigma’ with Antonio Casanova. 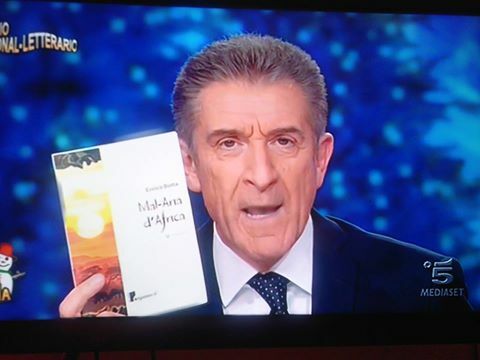 Mal-aria D’Africa is Enrico’s first novel and the title clearly alludes to the disease, literally meaning ‘bad air’, a contagion which once proliferated over marshland areas like the Italian Maremma. The novel is about a young entertainer who travels to Africa and, in particular to the beautiful lands of Kenya. Here he becomes seriously ill. Meanwhile an actor thousands of miles away in Milan puts on a replica of the entertainer’s last show. The two events are thus bound together in a strange parallel universe: Italy and Africa. Regrettably I won’t be able to attend this presentation since a friend and member of that heavenly vocal group Stereotipi who have done so much, through their school and performances, to raise musical standards in our part of the world, Lia Salotti, is, at the same time, arranging a presentation of a book of poems written by her mother Ivana Domenici. 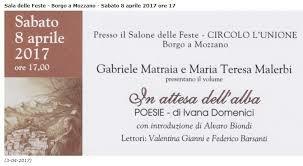 The appointment with poetry is also this Saturday at 5.00 pm in the hall of the former Convent of the Oblate in Borgo a Mozzano. Present will be the poet Ivana Domenici who teaches history at Borgo a Mozzano’s school Borgo a Mozzano. The book is published by Ama Ducci and enriched with illustrations by Mirco Martinelli. It brings together some forty poems that retrace the author’s life: feelings and emotions and moments. The event will be presented by Gabriele Matraia and Maria Teresa Malerbi, while actors Valentina Gianni and Federico Barsanti will read selections from the book. There’s also going to be a musical accompaniment with Martino Biondi, guitar, Lia Salotti, violin, and Serena Salotti, voice. Ever since the Missa Luba was first heard and recorded in the 1958 there has been a succession of world music masses. 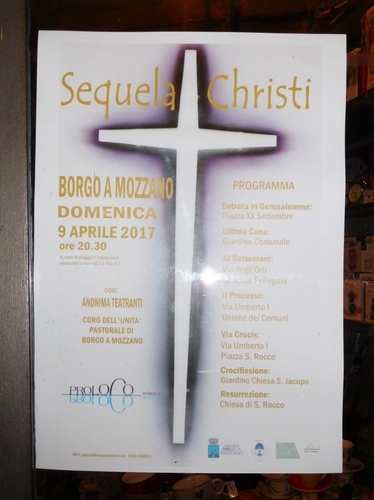 Among these the Missa Criolla (performed by Andrea Salvoni’s choir in Barga cathedral last year – see my post on it at https://longoio2.wordpress.com/2016/06/27/a-choral-feast-at-barga/ ) stands out. 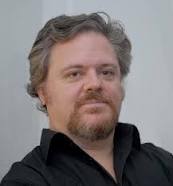 I was, therefore, particularly keen to hear the Misa Tango, composed by contemporary Argentinian composer Martin Palmeri, at the convent church of San Francesco, Borgo a Mozzano last night. 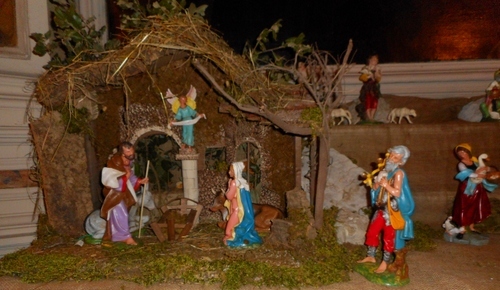 The item formed part of the Christmas concert organized by the Stereotipi vocal group. I was lucky enough to participate as a member of the choir in one of these concerts in December 2012 when we sang (among other pieces) a Mass by Michael Haydn, Joseph’s brother. 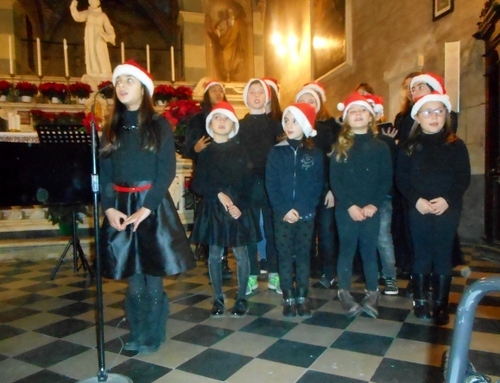 The children’s choir (beautifully expressed in Italian as ‘voci bianche’ – white voices) sang a selection of Christmas songs with a grace far beyond that of the standard songs that children of that age are expected to perform in Italy (i.e. largely fatuous ‘pop’). It just shows how teachers Serena Salotti and Felicity Lucchesi have been able to get those of a young age to sing to a standard expected in such places as the typical English cathedral choir school. The fine Stereotipi choir – now expanded to a good dozen voices – followed with Faure’s exquisite ‘Cantique de Jean Racine’. 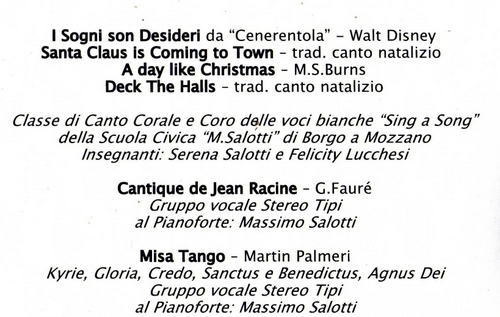 As with the previous item, the balance between voice and piano, superbly played by Massimo Salotti (friend but no relation), was well-judged. It may seem a strange mixture of sacred and profane to set a Latin Mass to tango rhythms but then tango is itself a form that has been raised to the highest level by such composers as Ginastera and Piazzolla. (See my post on the latter at https://longoio2.wordpress.com/2015/07/02/tango-where-astor-piazzolla-originated-from/). After all, didn’t sublime musicians, like Bach and Mozart, raise dance music, such as gavottes, minuets and sarabandes, to the highest levels in their compositions? The tango’s often acerbic harmonies and its infectious syncopations were fully captured by the ensemble accompanied by Massimo who truly understood the heart of the genre on the keyboard. It was most appropriate that this Argentinian Mass was performed in St Francis convent for, after all, isn’t the present pope also Argentinian and called Francis? The Stereotipi had previously performed the Misa Tango in Livorno in the full arrangement for choir, soloists, and orchestra which should include that flexible South American tango instrument, the bandoneon. However, it was agreed that, just with a small choir doubling as soloists and a piano accompaniment, the essential impact of this extraordinarily infectious work was well-realised. Again, for a free concert at Christmas time offered by the munificence of dedicated musicians, the church should have had a rather larger audience. However, those present fully appreciated the immense effort that had gone into the interpretation of yet another masterpiece of world music. In a church attractively decorated with poinsettias, courtesy of Olesia Fiori ad Arte and with sponsorship from Borgo’s Misericordia, Valentina Brecevich did a fine job in presenting the evening and wished us all a Very Merry Christmas which, clearly I extend to all my readers! 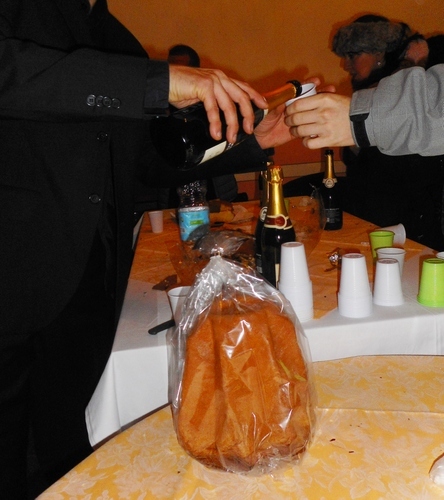 Afterwards we met up with the dedicated musicians in the adjoining hall for a well-deserved rinfresco of prosecco and panettone – the Italian equivalent of other countries’ minced pies and mulled wine and even more delicious! The evening was truly a joyous one and we left the historic convent with lighter hearts and happier expectations! Well done to all those involved as performers and collaborators at this memorable evening! The ‘Incontri Musicali – i luoghi del bello e della cultura’ season is on this November. It’s organized by the “Marco Salotti” School of Music at Borgo a Mozzano, with the patronage of the Municipality of Borgo a Mozzano and the collaboration of Teatro Colombo of Valdottavo, the Barga and Castelnuovo di Garfagnana Civic Schools of Music, the Borgo a Mozzano Misericordia and the Cluster Association from Lucca. Artistic direction is by Giacomo Brunini. 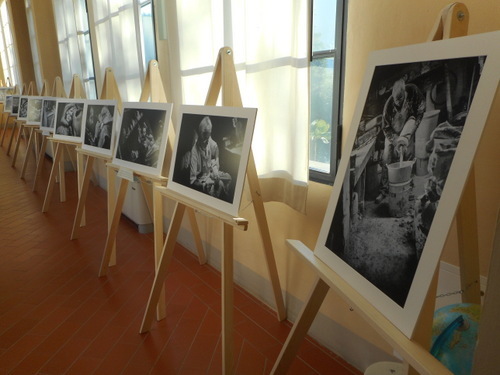 The event, now in its seventh year, will take place in Valdottavo’s beautiful “Colombo” Teatro Comunale, in other beautiful halls of the Municipality of Borgo a Mozzano such as the Palazzo Santini Municipal Library and the convent of San Francesco so as to allow the public to rediscover gorgeous locations in the municipality. The six concerts in the program will range from early music to jazz to contemporary music. On Sunday, December 4 at 5 pm in the convent of San Francesco in Borgo a Mozzano there’s a recital by guitarist Nuccio D’Angelo. 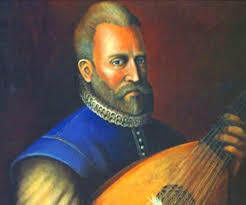 The program includes music by John Dowland and J.S Bach. All concerts are free admission with offering. 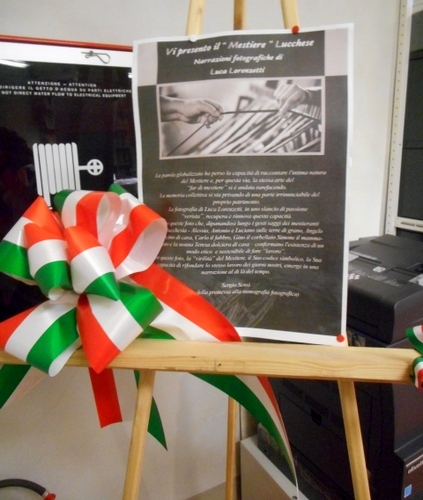 On Sunday, December 11th at 5 pm in the town library of Borgo a Mozzano there’s a concert by the ” Etymos Ensemble “organized in collaboration with the CLUSTER Association of Lucca.